AND HE’S MANKIND’S LAST HOPE…AGAIN. BEVERLY HILLS, CA (July 18, 2016) – “Ash vs Evil Dead,” the 10-episode half-hour STARZ Original series, is the long-awaited follow-up to the classic horror film The Evil Dead. The series is executive produced by Sam Raimi (The Evil Dead, The Grudge), Rob Tapert (The Evil Dead, The Grudge), and Bruce Campbell (“Burn Notice,” Oz the Great and Powerful, The Evil Dead, Evil Dead II, Army of Darkness), the original filmmakers, and Craig DiGregorio who serves as executive producer and showrunner. 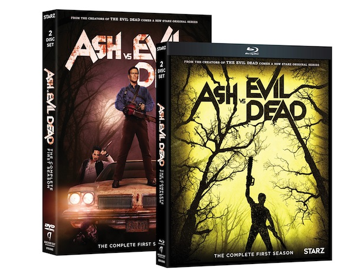 With a suggested retail price of $49.99 for Blu-ray™ and $39.98 for DVD, “Ash vs Evil Dead” includes exclusive audio commentaries by Bruce Campbell and more! To learn more about this title, please visit www.anchorbayentertainment.com.